IIM Ahmedabad was established in 1961. The institute provides various postgraduate diploma courses in several disciplines like marketing, finance, human resource etc. IIM Ahmedabad also has fellowship programs in MBA. The college has been consistently ranked as the top MBA College in India. The institute is known to attract placements from diverse sectors like banks, financial firms, FMCG companies, automobile sector, media etc. IIM, Ahmedabad has a big list of alumni who are heading top positions in various MNCs and Government institutions. MICA was established in 1991 and is an autonomous, non-profit institution. It is one of the only MBA college in India to provide residential courses in the field of Marketing and Communication. MICA runs two courses in PG diploma in marketing and communication and one course as a fellowship program. Apart from this, MICA also runs some online courses in the field of marketing and media. It has been recognized by the big media houses of India for its research in the field of media, advertising and communication. Institute of management, Nirma, Ahmedabad was started in 1996. It provides courses in various fields like economics, finance, marketing, human resource, organizational behavior, strategy, and entrepreneurship, etc. The institute also provides integrated course for BBA and MBA, MBA full-time courses, MBA specific to family business and entrepreneurship as well as executive programs. It also has a number of publication and research articles to its name. 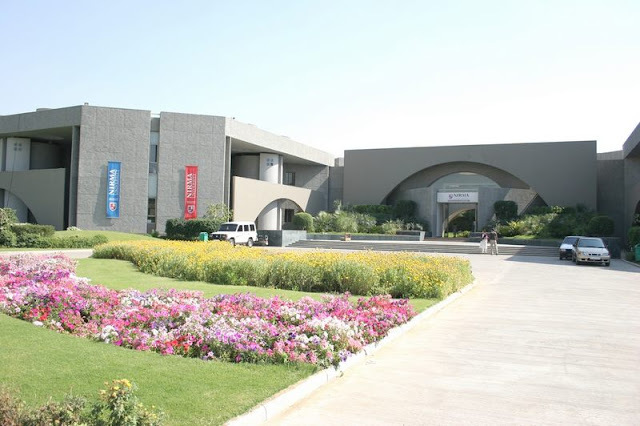 Nirma University is aptly ranked amongst the top MBA colleges in Ahmedabad. Narayana business school has the legacy of more than 17 years in the field of management education. The college runs various courses in management like postgraduate diploma in management, MBA+PGPCE, Executive PGDM program as well as CFA program. Narayana business school has a well-developed teaching infrastructure and uses the latest technology for teaching. The curriculum designed for teaching is in accordance with the international standards in business management. The college is backed by a sizeable list of companies in different sectors approaching the college for placements. The institute was established in 2008 and now it has history of 10 years since inception. It runs two courses - PGPM + MBA and GDBA +BBA in management. The major strength areas for this institute include the brand name of Amity which has been in academics for 21 years now and has been providing education in various sectors. Amity also has a world-renowned infrastructure aiding in providing quality education. Amity has been ranked as No.1 private university and is ranked 7th among the business schools by corporates for MBA in India. Adani Institute of Infrastructure Management is run by Adani group which is itself a renowned business group of India. AIIM is known for its excellent infrastructure and state of the art facilities. The institute has industry academia interface which is provided by laureates of the industry. AIIM also has international exchange programs and provides real-world industry exposure to the students along with the academics. Ahmedabad has a range of good business schools that are amongst the best MBA Colleges in India, providing a wholesome experience to learning of business along with a real-world exposure of management.